Objective: To compare physiological stress response modulating potentials of triethylene glycol and quercetin in mice. Methods: Effects of single and 10 daily oral doses (5, 20, 100 and 400mg/kg/day) of quercetin and triethylene glycol (TEG) to male mice on foot shock stress induces transient hyperthermia and on basal rectal temperatures and body weight changes, and of their 11 daily doses in tail suspension test and on pentobarbital induced sedation were compared. In further experiments, the effects of their 11 and 12 daily minimally effective stress response suppressing doses (5mg/kg/day) in two versions of the marble burying test for anxiolytics were assessed. Results: Dose dependant efficacies of quercetin and TEG for suppressing transient hyperthermia triggered by 1min duration of foot shock stress increased with increasing numbers of their daily dose, and body weight losses and slight elevation of basal core temperatures triggered by daily handling and occasional foot shocks were also antagonized by both of them. Significant effects of even the lowest tested (5mg/kg/day) doses of both of them were observed after their 11 daily doses in tail suspension test in mildly stressed mice, bur after such treatments only quercetin had statistically significant effects in one of the two versions of the marble burying tests in stressed mice. Conclusion: Fairly low daily, but not single, oral doses of quercetin and TEG desensitize physiological stress responses of male mice triggered by occasional exposures to short duration of foot shocks. Both of them possess daily dose dependant antidepressant like activities, and after their low stress response suppressing doses only quercetin possess some anxiolytics like activity in stressed mice. Since gut microbial ecology regulates oxidative status and metabolic stress,16,17 we speculated that by virtue of their bactericidal activities both qercetin and TEG could also alter microbial ecology inside the gastrointestinal tract and thus could contribute to stress response desensitizing or adaptogenic activity of Withania somnifera extracts. Consequently, efforts to experimentally very this possibility are now being made in our laboratories. Results of the very first set of experiments revealing and reconfirming stress response desensitizing potentials of their fairly low oral daily doses will be presented in this communication. The pharmacologically validated and standardized mouse bioassay procedure used in these experiments evolved during our efforts to define therapeutically interesting psychopharmacological activity profiles of diverse types of plant extracts according to Ayurvedic therapeutic principles.18 Usefulness of the procedure for estimating pharmacologically interesting doses and dosage regimen of a Withania somnifera 19 or of those of bioactive constituents of other stress response suppressing or adaptogenic herbs have also been reconfirmed.20-24 Since anxiolytics like efficacies of diverse types of Withania somnifera extracts have been observed in several clinical trials,25 further analogous experiments were conducted to verify whether low daily stress response suppressing doses of quercetin and TEG also possess anxiolytic activity or not. Possible implications of the observations reported in this communication for better understanding of biological process involved in traditionally known medicinal plants for dietary and herbal therapies will be disused also. Adult male albino mice (20±5 g) were used in this study. Prior approval from the Central Animal Ethical Committee of the University (CAECU) was taken for the study protocol (Dean/2014/CAEC/608, dated 30-5-2014). All animals were acclimatized to steady laboratory environment at least one week before starting the experiment. They were randomly housed in groups (n=6) in polypropylene cages (28×19×12.5) and maintained at an ambient temperature (25±1°C) and relative humidity (45-55%) with a 12:12 hr light/dark cycle. Cages were provided with husk and were cleaned routinely. Animals were freely provided or access to standard rodent pellets and water ad libitum. All experimental groups in a given experiment were tested in parallel (i.e. on the same days of the experiments) and all tests were conducted between 09.00 to 14.00 hr and 60 min after the day's oral treatments. All animals in each experiment were handled and weighed daily during the experiments and except when stated all observations were made by the same blind observer and in the same laboratory environment. Quercetin was purchased from Cayman chemical company (Michigan, USA), triethylene glycol was from Spectrochem (Mumbai, India), dimethyl fumarate and fumaric acid from Sigma Aldrich (Bengaluru, India), Carboxymethyl cellulose from Central Drug House Pvt. Ltd. (New Delhi, India) and pentobarbital sodium from Loba Chemie Pvt. Ltd. (Mumbai, India). All other reagents and chemicals used were of highest quality commercial available in India. In each of the two pilot experiments conducted to estimate stress response modulating doses and treatment regimen of triethylene glycol (TEG) and quercetin, six groups of six animals each were used. In the experiment with TEG, distilled water was used as vehicle and the vehicle treated control group was treated daily with distilled water (10 ml/kg/day). The reference group in this experiment was treated with fumaric acid (FUM; 10 mg/kg/day) dissolved in distilled water. In other experiment with quercetin, the control group was treated daily with 0.3% carboxymethyl cellulose (CMC) and the reference group with 10 mg/kg/day dimethyl fumarate suspended in 0.3% CMC. Choices of reference substances in these experiments were based on our earlier observations reconfirming that fumaric acid and its esters are stress response suppressing secondary metabolites of the adaptogenic herb of Fumaria indica and that fumaric acid and dimethyl fumarate are almost equally effective in modulating central sensitivity to metabolic and enviorenmental stress triggered responses quantified in the mouse bioassay system used in this study26 For oral administrations, water insoluble quercetin and methyl were suspended in CMC and the water solution of TEG and fumaric acid were adjusted to pH 7.4 and application volume were always 10 ml/kg. All oral treatments were given for 11 consecutive days of the experiments. In both the pilot experiments graded daily doses (5, 20, 100 and 400 mg/kg) of TEG, or of quercetin, were orally administered for the same number of days. In these two experiments, on days 1, 5, 7 and 10 of both these experiments all animals were subjected to foot shock stress triggered hyperthermia tests and on the 11th day all test groups were subjected to tail suspension test for potential antidepressants. On the 12th day of the experiment (i.e. 24 hr after the last treatments) all test groups were subjected to pentobarbital sleep tests for assessing longer lasting effects of treatments on brain functions or on drug metabolizing enzymes. In each of the two further analogous experiments conducted to compare anxiolytic like activities of low effective daily oral doses (5 mg/kg/day) of TEG and quercetin in two versions of marble burying test, three groups of randomly selected animals were randomly allotted to each of the three experimental groups consisting of 6 animals each. The treatment groups used were as follows: Group I: Stress control (vehicle treated); Group II: Non-stress control (vehicle treated); Group III: (TEG or quercetin, 5mg/kg/day). In these experiments, the test agents and their vehicles were orally administered for 12 consecutive days and only the animals of the groups I and II were subjected to foot shock stress induced hyperthermia test on 1st, 5th, 7th and 10th day of the experiments. On the 11th day of these experiments, all animals of all the three groups of an experiment were subjected to a standard version of marble burying test (one zone) and on day 12 they were similarly tested similarly in the two-zones marble burying test. All animals in all experiments were closely observed for apparent behavioural abnormalities during the course of the experiments. Body weight and basal rectal temperatures of all animals used in different experimental groups were recorded on each observational day, whereupon the basal rectal temperatures were recorded one hour before the day’s treatment. This test was conducted by placing an individual mouse of a test group in a black box (24 x 29 x 40 cm) with a metallic grid floor for 1 min. During this period electric foot shocks were delivered through the grid floor (2 mA, 50 Hz of 2 ms duration) for inducing stress triggered transient hyperthermia.27,28 Five consecutive foot shocks of 2 mA at 10 s interval were given 10 s after placing the animals in the test box. At the end of the minute, the animal was placed back to its home cage and 10 min thereafter their rectal temperatures were recorded again. Numerical differences between the rectal temperature of a given animal before oral administrations and 10 min after the foot shock session was calculated and used as an index for stress triggered transient hyperthermia. Animals of non-stressed groups in two of the four described experiments were also placed in the black box with grid floor for 1 min, but no foot shocks were given to them on the test days and their rectal temperatures were also measured again 10 min after they had been placed back to their home cages. All rectal temperatures were recorded by using a calibrated rectal probe and electronic thermometer (Digital Thermometer; Dr. Gene, New Delhi, India). Two versions of this test often used for identifying anxiolytic activity of test agents potentially useful of treatment of obsessive compulsive disorders31 were used on the 11th and 12th days of the two further analogous experiments. The standard, or the one-zone, version of the test was conducted on the 11th day of the experiments and the other version (two-zone version) on the 12th or the ultimate observational day of an experiment. In the standard version, an individual mouse of a group was gently placed in a cage (30 × 23 cm) where 12 glass marbles (color and size of marbles were always kept constant) were evenly spaced on the husk bedding of the cage. In this version of the test the animal was allowed 15 min for burying or covering a marble at least two-thirds by husk.32 In the two-zone version of the test 8 glass marbles were evenly spaced only on one half of the cage and 30 min time was allowed to the animal for burring or covering the marbles at least two-thirds by husk. In both versions of the test, a blind observer unaware of the treatment given to the animal counted the numbers of marbles buried or two-third covered with husk by the animal during its stay in the box. All data were expressed as mean ± standard error of mean (SEM). Statistical analysis was performed by analysis of variance (one way ANOVA) followed by Bonferroni post hoc test and student t test wherever necessary. GraphPad Prism-5 (GraphPad Software Inc., California, USA) software was used for statistical analysis. Origin Pro 8 software (Origin Lab Corporation, Massachusetts, USA) was used for making graphs. P value less than 0.05 was considered as statistically significant. Body weights: Mean body weights of different groups of animals recorded during the course of the experiments are summarized in the Figure 1A & 1B. Body weights of the animals in both the vehicle (CMC or distilled water) treated control groups steadily decreased and those of the reference agents (fumaric acid and dimethyl fumarate) increased during the course of the experiments. Observed effects of all tested daily oral doses of quercetin and TEG were qualitatively as well as quantitatively quite analogous to those of the 10 mg/kg/day doses of fumaric acid or its dimethyl ester. Their statistically significant protective effects against intermittent foot shock stress triggered body weight losses were observed only after their 7 or more daily doses and their efficacies continued to increase during the last five days of the experiments. 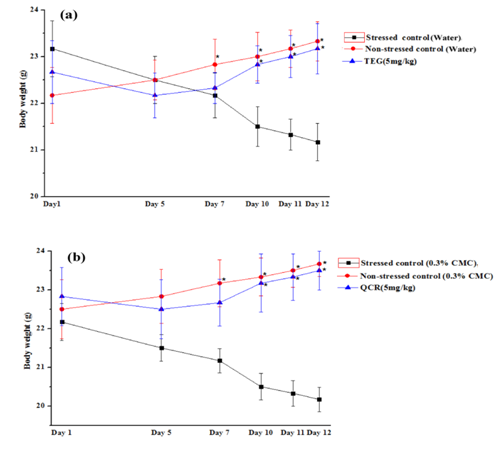 These results reveal that the maximally effective daily oral doses of TEG and quercetin in suppressing the experimental procedures triggered weight losses is 5mg/kg or lower and that even their 11 highest tested daily oral doses (400 mg/kg/day) have no adverse effects on body weight gain rates of male mice occasionally subjected to only 1 min duration of painful foot shocks. Basal core temperatures: Mean basal rectal temperatures of all groups of both the experiments on the first observational days were within normal ranges of the mouse colony used in this and other studies commonly used in our laboratories. On the 5th days of the experiments, mean core temperatures of the vehicle (CMC or distilled water) treated control groups recorded before subjecting them to foot shock stress triggered hyperthermia tests were slightly, but significantly, higher than those recorded on the first observational day of the experiments. Except for the fumaric acid treated group, these elevations in basal core temperature triggered by exposures of animals to 1 min duration of foot shock stress on the first days of the experiments were almost equal in all test groups. It is apparent from the results summarized in Figure 2A & 2B that mean basal core temperatures of the vehicle treated control groups remained elevated during the subsequent observation days, whereas those of all triethylene or quercetin treated ones continue to decrease from the 7th and further days of the experiments.These observed effects of even the lowest daily oral dose (5 mg/kg/day) were qualitatively and quantitatively quite similar to those of 10 mg/kg daily doses of fumaric aid and its dimethyl ester. 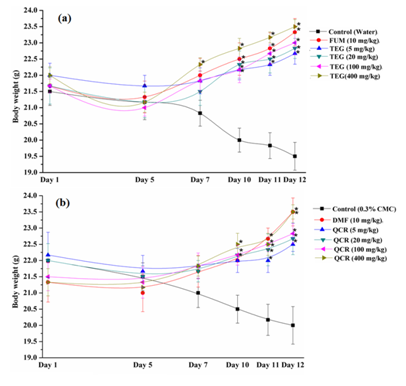 These results reaffirm that both quercetin and triethylene are fumarates like stress response suppressing agents and that their five daily oral 5 mg/kg doses are their maximally effective ones for desensitizing male mice against very short duration of painful foot shocks triggered prolonged elevations in their basal core temperatures. Foot-Shock Stress Induced Hyperthermia (FSIH): Magnitudes of FISH of the vehicle treated control groups observed 10 minutes after exposures to foot shocks on the very first and subsequent observational days remained almost constant in both the experiments (Figure 3A & 4B). These effects of a single 10 mg/kg oral dose of fumaric acid and its dimethyl ester were significantly lower than those of the corresponding control groups treated with their vehicles and increased only minimally after their 7 or 10 daily doses. Analogous were also the observations made with 100 or 400 mg/kg doses of quercetin and TEG. Although no statistically significant effects of 5 or 10 mg/kg doses of quercetin and TEG against FSIH responses were observed one hour after their single oral doses, their statistically significant effects were observed after their 7 or 10 daily doses. It is apparent from their log-dose response curves shown in Figures 3B & 4B that dose dependant efficacies of quercetin and TEG in suppressing FSIH increased with increasing with increasing numbers of days of treatments. The minimally effective 10 daily oral doses of both TEG and quercetin were 5 mg/kg/day. However, as shown in Figures 3A & 4A, statistically significant effects of this dose of TEG were observe only after its 10 daily doses whereas that of quercetin were observed even after its 5 daily doses. Tail suspension test: Results summarized in Figure 5A & 5B revealed that, mean immobility time of 10 mg/kg/day fumaric acid or dimethyl fumarate treated groups were significantly lower than those of the corresponding vehicle treated ones. Statistically significant and dose dependant effects of 11 consecutive daily oral doses of TEG and quercetin were observed and observed mean immobility time of the 5 mg/kg/day TEG or quercetin treated groups were significantly lower than those of corresponding control groups. However, quantitatively the observed effects of 5 or 20 mg/kg/day of TEG or of quercetin in this test were not as high as those 10 mg/kg daily doses of fumaric acid or of dimethyl fumarate. Pentobarbital induced sleep test: These results are summarized in (Table 1). Although no significant effects of 11 daily 10 mg/kg doses of fumaric and its dimethyl ester on pentobarbital induced sleep induction time were observed, both of them slightly but significantly prolonged the sleeping time of animal tested 24 hours after their last oral doses. Analogous were the observations made for 5 or 20 mg/kg/day triethylene treated groups. However after it higher doses (100 and 400 mg/kg/day) it shortened sleep induction time and also prolonged the duration of pentobarbital induced sleep. Sleep onset time of 5 mg/kg/day quercetin treated group was significantly shorter than that of the corresponding control group and this effect of quercetin treatment observed 24 hours after its 11 daily doses increased somewhat with its increasing daily doses tested. However, except for the 5 mg/kg/day quercetin treated group, mean duration of sleep in 20 mg/kg/day and higher daily doses of quercetin had no significant effects on duration of sleep induced by pentobarbital. Body weight and basal core temperature: Mean body weights and basal core temperatures of experimental groups of these experiments are summarized in Figure 6 & 7 respectively. These results reconfirm that alterations in body weights and basal core temperatures of stressed or unstressed mice treated with CMC or distilled water are almost identical during the course of the experiments. As expected from the results of the pilot experiments, these alterations in the 5 mg/kg/day quercetin or triethylene treated stressed animals were almost identical to those of the corresponding vehicle treated non-stressed groups. Foot shock stress induced hyperthermia (FSIH): Diverse versions stress induced hyperthermia tests in rodents are often used for identifying anxiolytic agents or for assessing anxiety state of animals.33 Observations in our laboratores have revealed that althoug a single 5 mg/kg oral dose of the anxiolytic diazepam have no significant effects in the FISH test used in in this study, after a few days of dily oral treatments of mice with is same dose suppressse FISH responses and that 15 mg/kg oral imiprimane doses had no significant effects in the test after its single or repeated daily doses.23 The results summarised in the Figure 8A & 8B revealed that the FSIH responses of both the CMC and distilled water treated groups in creased slightly during the course of the experiments and that such responses of 5 mg/kg/day quercetin or TEG treated groups were always significantly lower than the corresponding vehicle treated groups. Howere, the corresponding core temperatuers of of the CMC or distilled water treated control groups of the experiments not subjected to foot shocks were always lower than the guercetin or TEG treated stressed groups on all observational days. It must be mentioned though, that unlike in the dose finding experiments significat effects of 5 mg/kg doses of both quercetin and TEGe were observed after their first or 5 daily doses. This discrepancy could be due to different batches of animal used in different sety of experiments, or other as yet unrecognised factors (seasonal variations etc,) that alters thermoregulatory mechanisms of laboratory rodents. Marble burying test: It has recently been reported that single intraperitoneally administrated 25 mg/kg doses of two different types of Withania somnifera root extracts possesses fluoxetine like effects in a mouse marble burying test for anxiolytics and obsessive compulsive disorders.34 Observations in our laboratories have reconfirmed the efficacies of diverse types of Withania somnifera extracts in both versions of marble burying test in stressed and unstressed mice after their repeated daily oral doses.35 Results of the experiments reported in this report reconfirmed that the marble burying behaviour of CMC or distilled water treated control animals in both versions of the test are almost identical and that this behaviour in both stressed control groups of mice were also almost identical to those of the corresponding non-stressed ones. Although statistically significant effects of 12 daily 5 mg/kg quercetin treated group in the two-zone version of the test was observed (Table 2), its 11 daily doses had no statistically significant effects on the standard or one zone version of the test. Since both TEG and quercetin had no statistically significant effects in the on days 11 of the experiments, these results are not shown here. Figure 1 Effect of stress on body weight of male mice treated with graded doses of (A) triethylene glycol and (B) quercetin. TEG: Triethylene glycol, FUM: Fumaric acid, QCR: Quercetin, DMF: Dimethylfumarate, CMC: Carboxymethylcellulose. Values are mean ± SEM (n=6). Statistically significant differences (Two way ANOVA followed by Bonferroni post test) relative to corresponding control groups are marked with *p<0.05. Figure 2 Effect of stress on basal rectal temperature of male mice treated with graded doses of (A) triethylene glycol and (B) quercetin. TEG: Triethylene glycol, FUM: Fumaric acid, QCR: Quercetin, DMF: Dimethylfumarate, CMC: Carboxymethylcellulose. Values are mean ± SEM (n=6). Statistically significant differences (Two way ANOVA followed by Bonferroni post test) relative to corresponding control groups are marked with *p<0.05. 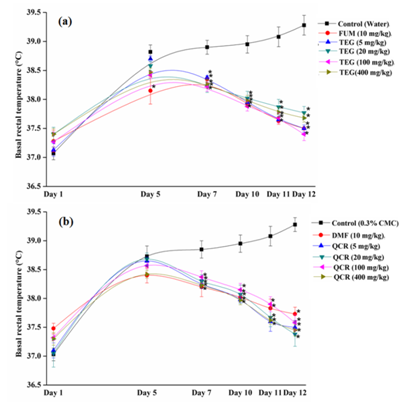 Figure 3 Stress induced hyperthermia of male mice treated with graded doses of (A) triethylene glycol and (B) log dose response curve of single and daily repeated treatment with triethylene glycol in the foot shock stress induces hyperthermia test. TEG: Triethylene glycol, FUM: Fumaric acid. Values are mean ± SEM (n=6). Statistically significant differences (Two way ANOVA followed by Bonferroni post test) relative to control group are marked with *p<0.05. 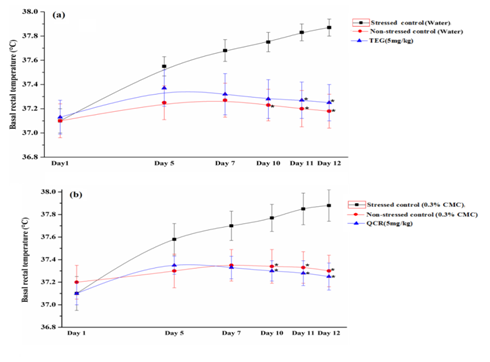 Figure 4 Stress induced hyperthermia of male mice treated with graded doses of (A) quercetin and (B) log dose response curve of single and daily repeated treatment with quercetin in the foot shock stress induces hyperthermia test. QCR: Quercetin, DMF: Dimethylfumarate, CMC: Carboxymethylcellulose. Values are mean ± SEM (n=6). Statistically significant differences (Two way ANOVA followed by Bonferroni post test) relative to control group are marked with *p<0.05. Figure 5 Effect of (A) triethylene glycol and (B) quercetin on tail suspension test in male mice on day 11. TEG: Triethylene glycol, FUM: Fumaric acid, QCR: Quercetin, DMF: Dimethylfumarate, CMC: Carboxymethylcellulose. Values are mean ± SEM (n=6). Statistically significant differences (one way ANOVA followed by t-test) relative to corresponding control groups are marked with *p<0.05. Figure 6 Effect of (A) triethylene glycol and (B) quercetin on pentobarbital induce hypnosis test in male mice on day 12. TEG: Triethylene glycol, FUM: Fumaric acid, QCR: Quercetin, DMF: Dimethylfumarate, CMC: Carboxymethylcellulose, Water: Distilled water. Values are mean ± SEM (n=6). Statistically significant differences (one way ANOVA followed by t-test) relative to corresponding control groups are marked with *p<0.05. 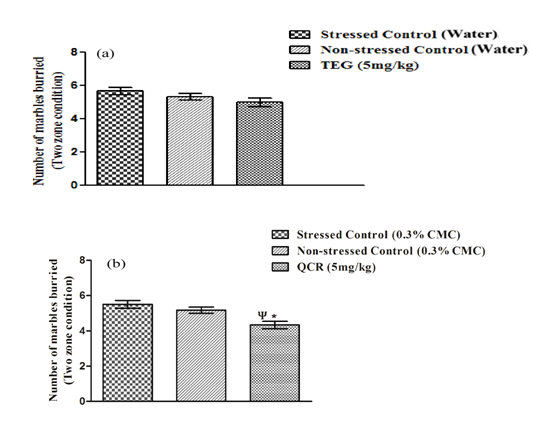 Figure 7 Effect of stress on body weight of male mice treated with (A) triethylene glycol and (B) quercetin. TEG: Triethylene glycol, QCR: Quercetin, CMC: Carboxymethylcellulose. Values are mean ± SEM (n=6). Statistically significant differences (Two way ANOVA followed by Bonferroni post test) relative to corresponding stressed control groups are marked with *p<0.05. Figure 8 Effect of stress on basal rectal temperature of male mice treated with (A) triethylene glycol and (B) quercetin. QCR: Quercetin, TEG: Triethylene glycol, CMC: Carboxymethylcellulose. Values are mean ± SEM (n=6). Statistically significant differences (Two way ANOVA followed by Bonferroni post test) relative to corresponding stressed control groups are marked with *p<0.05. Figure 9 Effects of (A) triethylene glycol and (B) quercetin on foot shock stress triggered transient hyperthermia in male mice. QCR: Quercetin, TEG: Triethylene glycol, CMC: Carboxymethylcellulose. Values are mean ± SEM (n=6). Statistically significant differences (Two way ANOVA followed by Bonferroni post test) relative to corresponding stressed control group are marked with *p<0.05. Figure 10 Effects of (A) triethylene glycol and (B) quercetin on marble burying test (two zone condition) in male mice on day 12. QCR: Quercetin, TEG: Triethylene glycol, CMC: Carboxymethylcellulose. Values are mean ± SEM (n=6). Statistically significant differences (One way ANOVA followed by student t-test) relative to corresponding stressed control group and non-stressed control group are marked with *p<0.05 and ψp<0.05 respectively. Estimated mean maximally effective daily oral doses of fumaric acid and its methyl esters after their repeated once daily oral treatments were always between 1 and 15 mg/kg. /day in various rodent models commonly used for identifying drug leads potentially useful for treatments of anxiety, depression, pain and inflammation. 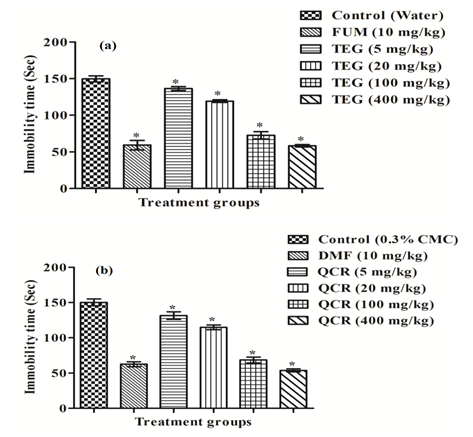 Therefore, 10 mg/kg/day doses of water soluble fumaric acid was used as a reference substance in the dose finding experiment with TEG and the same dose of di-methyl fumarate for the experiment with the water insoluble quercetin which were suspended in 0.3% CMC for daily oral administrations. Results of the confirmatory experiments reaffirm that body weights and basal core temperatures of the distilled water or 0.3% CMC treated stressed and non stressed control groups on all observational day were almost identical and such were also the observations in the FSIH and marble burying tests. These observations not only justify uses of CMC as a vehicle for water insoluble substances in the bioassay used, but also reaffirm that despite structural and other differences in their water solubility and physicochemical properties, both quercetin and TEG are almost equiactive as stress response suppressing agents with antidepressants and anxiolytic like effects after their repeated daily oral doses only. It has recently been reported that single oral 15 mg/kg dose of quercetin to mice improves redox status but does not affect heat shock stress responses.41,42 Numerous observation in our laboratories and elsewhere have often revealed also that maximally effective stress response suppressing doses and doses regimen of adaptogenic herbal extracts and their bioactive constituents are often not effective in their psychopharmacological and other activities observed after their higher or acute doses. Therefore, the confirmatory experiments were conducted to experimentally verify the possibility whether after their 10 or more daily 5 mg/kg oral doses quercetin and TEG also possesses Withania somnifera extracts like effects on obsessive compulsive behavior of stressed mice or not. Results of these experiments revealed that although quercetin posses some significant effects in the two-zone version of the marble burying test, it had no observable effects in the other version of the same test and TEG had no observable effects in both versions of the test. Since such were not the observations made with a Withania somnifera extract tested earlier in our laboratories,43 these observations suggest that apart from quercetin and TEG other bioactive secondary metabolites are also involved in the broad spectrums of psychopharmacological activity profiles of the plant. Fumarates and other structurally diverse plant metabolites with microbicidal activities and antibiotics have since long been used by agricultural farm industries as growth promoters and it is now well recognized that their modulating effects on gut microbial ecology also contribute to their growth promoting effects.44 More recently it has been reported also that like other dietary emulsifiers, daily CMC intake with drinking water by laboratory mice alters their gut microbial ecology and increases their body weight gain rates after 20 or more days of its regular intake.45 In the confirmatory experiments reported in the present communication, 12 daily oral administrations of 0.3% CMC (10 ml/kg/day) also had no effects on body weight gains in the non stressed mice and the body weight losses and all other quantified parameters in CMC only treated stressed mice during the course of the experiments were also similar in magnitude to those observed in distilled water treated ones. 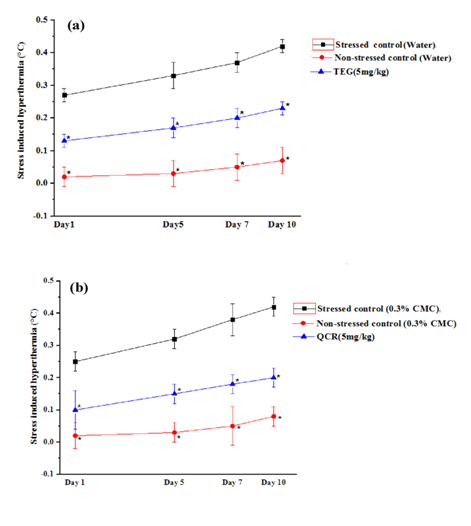 These and the other observation that 5 or more daily oral 5 mg/kg/day oral doses of quercetin or TEG are their maximally effective ones for desensitizing stress triggered body weight loses and alterations in thermoregulatory processes could suggest that they are either more effective modulators of gut microbial ecology than CMC, or that their these observed effects are not entirely due to their potential ability to modulate gut microbial ecology. Although further more detailed studies will be necessary for more definitive statements on possible involvement of gut microbiota in their modes of actions, it remains certain that both of them are more potent stress response desensitizer than as potential antidepressant or anxiolytic agents and that observations made after their single doses are not very reliable predictors of their bioactivity profiles after their regular oral intake. The experiments described in this communication constitute a part of our ongoing efforts to identify bioactive constituents of Withania somnifera and other Ayurvedic adaptogenic plants currently often used, or prescribed by practitioners of Indian system of medicines, for prevention and cure of psychosomatic disorders. Quercetin is one of the numerous plant phenolics encountered in numerous (if not most) such plants and extensive efforts made during the past few decades have often pointed out its medicinal values for prevention and/or cure of obesity diabetes and other silently progressing metabolic disorders,46 as well as diverse mental health problems commonly caused by uncontrollable anxiety and depression.33 However, doses and dosing regimen used in all such studies varied enormously and as yet no very definitive statements on its modes and sites of actions involved in its diverse therapeutically interesting bioactivities observed after its diverse doses and treatment regimen used in the experiments can be made.47 Such are also the cases for numerous other phytochemicals with analogous spectrums of bioactivities and fairly low oral bioavailability (as judged by their blood levels observed after their oral doses). It is now becoming increasingly apparent though, that quercetin and numerous such phytochemical are pleiotropic protective agents and that adaptive cellular stress pathways are involved in their health benefits observed after their regular intake with food and herbal remedies.48,49 Our observations revealing stress response desensitizing effects of fairly low repeated daily doses of quercetin and TEG strongly suggest that their herbal adaptogens like efficacy continue to increase with the numbers of their daily oral doses and that there sites of actions are most probably within the gastrointestinal tract. Unlike for quercetin, fumarates and diverse other acidic and basic phytochemicals well known as plant hormones or plant protectors, as yet only very little efforts have been made to define the health effects of numerous water soluble plant polyols well known for their stress response regulators in plants.50,51 Such plant polyols are often encountered in aqueous herbal extracts and reports on diverse medicinally interesting bioactivities in experimental animals have continued to increase during more recent years. 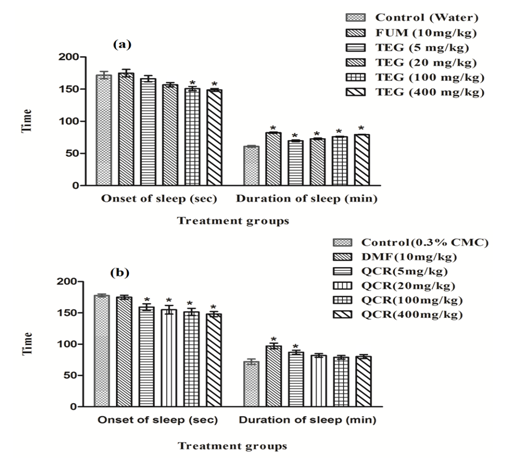 It has recently been reported that TEG is one of the bioactive constituent of aqueous extracts of Withania somnifera involved their cytostatic or anticancer activities.6 Observations reported in this communication revealing its stress response desensitizing effects after its relatively low doses, encourage us suggest that further effort to identify and pharmacologically characterizes this and other water soluble plant polyols with microbicidal or anti-fungal activities traditionally known medicinal plants should be made also. Such efforts are not only necessary for better understanding the pharmacology of edible and medicinal plants, also for more rapid progress necessary for fore evidence based integration of herbal remedies in modern medical practices. It is now well recognized that alterations in gut microbiota in early life can have long lasting effects on body weight in adulthood52 and that gut microbial ecology can be altered by numerous food phytochemicals with bactericidal activities.53 Since, quercetin and numerous other functionally analogous molecules with bacteriostatic, antidiabetic, anti-inflammatory and diverse other therapeutically interesting bioactivities are now known and diverse combinations of such molecules are often regularly consumed with food, herbal remedies and nutraceuticals, efforts to better define pharmacological interactions between them seems to be an urgent necessity for more rationally designing dietary or herbal therapies for prevention and cure of diverse chronic diseases. For such purposes, the mouse bioassay procedures used in this and in our early studies could be a useful starting point. Since quercetin is pharmacologically and toxicologically well defined phytochemical encountered in many herbal remedies and almost all plant derived food, efforts will now be made to quantify pharmacological interactions between this plant phenolic and other well known and quantitative major secondary plant metabolites with bactericidal activities. Both quercetin and triethylene glycol are fairly potent desensitizer of stress responses with antidepressants and anxiolytics like activities in mice behavioural models and their such efficacies start appearing only after their repeated daily doses. Therefore, they can also be considered as adaptogens potentially useful for prevention and cure of mental health problems arising from mild chronic uncontrollable stress of everyday life. Pawar VS, Shivakumar H. A current status of adaptogens: natural remedy to stress. Asian Pac J Trop Dis. 2012;S480‒S490. Kumar V, Dey A, Hadimani MB, et al. Chemistry and pharmacology of Withania somnifera. TANG [Humanitus Medicine]. 2015;5(1):1‒13. Fernando IDNS, Abeysinghe DC, Dharmadasa RM. Determination of phenolic contents and antioxidant capacity of different parts of Withania somnifera(L.) Dunal. from three different growth stages. Ind Crop Prod. 2013;50:537‒539. Singh B, Saxena AK, Chandan BK, et al. Adaptogenic activity of a novel, withanolide-free aqueous fraction from the roots of Withania somniferaDun. Phytotherapy Research. 2001;15:311‒318. Singh B, Chandan BK, Gupta DK. Adaptogenic activity of a novel withanolide-free aqueous fraction from the roots of Withania somniferaDun. (Part II). Phytother Res. 2003;17:531‒536. Wadhwa R, Singh R, Gao R, et al. Water Extract of Ashwagandha Leaves Has Anticancer Activity: Identification of an Active Component and Its Mechanism of Action. PLoS ONE. 2013;8(10):e77189. Ballantyne B, Snellings WM. Triethylene glycol HO (CH2CH2O) 3H. J appl toxicol. 2007;27(3):291‒299. Gilcreas FW, Read HR. Bacteriologic Studies in Disinfection of Air in Large Rural Central Schools: II. Ultraviolet Irradiation and Triethylene Glycol Vapor Treatment. Am J Public Health Nations Health. 1955;45(6):767‒773. Shu Y, Liu Y, Li L, et al. Antibacterial activity of quercetin on oral infectious pathogens. Afr J Microbiol Res. 2011;5:5358‒5361. Robertson OH, Puck TT, Lemon HF, et al. The lethal effect of triethylene glycol vapor on air-borne bacteria and influenza virus. Science. 1943;97(2510):142‒144. Mellody M, Bigg E. The fungicidal action of triethylene glycol. J Infectious Dis. 1946;79(1):45–46. Rosebury T, Meiklejohn G, Kingsland LC, et al. Disinfection of clouds of meningopneumonitis and psittacosis viruses with triethylene glycol vapor. J Exp Med. 1947;85(1):65–76. Lester W, Robertson OH, Puck TT, et al. The rate of bactericidal action of triethylene glycol vapor on microorganisms dispersed into the air in small droplets. Am J Epidemiol. 1949;50(2):175‒188. Haleagrahara N, Radhakrishnan A, Lee N, et al. Flavonoid quercetin protects against swimming stress-induced changes in oxidative biomarkers in the hypothalamus of rats. Eur j pharmacol. 2009;621(1):46‒52. Ahmad A, Khan MM, Hoda MN, et al. Quercetin protects against oxidative stress associated damages in a rat model of transient focal cerebral ischemia and reperfusion. Neurochem res. 2011;36(8):1360‒1371. Qiao Y, Sun J, Ding Y, et al. Alterations of the gut microbiota in high-fat diet mice is strongly linked to oxidative stress. Appl Microbiol Biotechnol. 2013;97(4):1689‒1697. Cani PD. Gut microbiota and obesity: lessons from the microbiome. Brief Funct Genomics. 2013;12(4):381‒387. Chatterjee SS, Kumar V. Holistic psychopharmacology and promiscuous plants and principles of ayurveda. American Journal of Plant Sciences. 2012;3:1015‒1021. Thakur AK, Dey A, Chatterjee SS, et al. Reverse Ayurvedic pharmacology of Ashwagandha as an adaptogenic anti-diabetic plant: A pilot study. Curr Trad Med. 2015;1(1):51‒61. Thakur AK, Chatterjee SS, Kumar V. Adaptogenic potential of Andrographolide: an active principle of the King of Bitters (Andrographis paniculata). J Trad Comp Med. 2015;5(1):42‒50. Langstieh AJ, Verma P, Thakur AK, et al. Densensitization of mild stress triggered responses in mice by a Brassica juncea leaf extract and some ubiquitous secondary plant metabolites. Pharmacologia. 2014;5(9):326‒338. Verma S, Chatterjee SS, Kumar V. Metformin like Stress Response Modulating Effects of Turmeric Curcuminoids in Mice. SAJ Neurology. 2015;1(1):102. Thakur AK, Chatterjee SS, Kumar V. Neuropsychopharmacology of a therapeutically used Andrographis paniculata extract: a preclinical study. Orient Pharm Exp Med. 2014;14:181‒191. Shrivastava N, Chatterjee SS, Kumar V. Stress response desensitizing efficacies of triethylene glycol and quercetin in mice. Indian J Pharmacol. 2014;46:S91. Pratte MA, Nanavati KB, Young V, et al. An Alternative Treatment for Anxiety: A Systematic Review of Human Trial Results Reported for the Ayurvedic Herb Ashwagandha (Withania somnifera). J Altern Complement Med. 2014;20(12):901‒908. Shakya A, Chatterjee S S, Kumar V. Role of fumarates in adaptogenics like efficacies of traditionally used Fumaria indica extracts. TANG [Humanitas Medicine]. 2015;(5):28‒37. Zethof TJJ, Van der Heyden JAM, Tolboom JTBM, et al. Stress induced hyperthermia in mice: a methodological study. Physiol Behav. 2011;55:109–115. Olivier B, Zethof T, Pattij T, et al. Stress-induced hyperthermia and anxiety: pharmacological validation. Eur J Pharmacol. 2003;463(1‒3):117‒132. Thakur AK, Chatterjee SS, Kumar V. Antidepressant-like effects of Brassica juncea leaves in diabetic rodents. Indian J Exp Biol. 2014;52:613‒22. Ojima K, Matsumoto K, Togha M, et al. Hyperactivity of central noradrenergic and CRF system is involved in social isolation-induced decrease in pentobarbital sleep. Brain Res. 1995;84:874‒894. Witkin JM. Animal Models of Obsessive‐Compulsive Disorder. Current protocols in neuroscience. 2008:9‒30. Nicolas LB, Kolb Y, Prinssen EP (2006) A combined marble burying-locomotor activity test in mice: a practical screening test with sensitivity to different classes of anxiolytics and antidepressants. Eur J Pharmacol 547(1‒3):106‒115. Bouayed J (2010) Polyphenols: a potential new strategy for the prevention and treatment of anxiety and depression. Curr Nutr Food Sci 6(1):13‒18. Kaurav BP, Wanjari MM, Chandekar A, et al. Influence of Withania somniferaon obsessive compulsive disorder in mice. Asian Pac J Trop Med. 2012;5(5):380‒384. Dey A, Chatterjee SS, Kumar V. Effects of a Withania somnifera extract in a stressed mice model for obsessive-compulsive disorders. Abstract In: 2nd International Congress of Society for Ethnopharmacology (SFEC - 2015). Nagpur, India; 2015. Kawabata K, Mukai R, Ishisaka A. Quercetin and related polyphenols: new insights and implications for their bioactivity and bioavailability. Food Funct. 2015;6(5):1399‒1417. Willner P. Chronic mild stress (CMS) revisited: consistency and behavioural-neurobiological concordance in the effects of CMS. Neuropsychobiol. 2005;52(2):90‒110. Shakya A, Chatterjee SS, Kumar V. Holistic psychopharmacology of Fumaria indica (Fumitory). Chinese Med. 2012;3(4):182‒199. Shakya A, Singh GK, Chatterjee SS, et al. Role of fumaric acid in anti-inflammatory and analgesic activities of a Fumaria indica extracts. J Intercultural Ethnopharmacol. 2014;3(4):173‒178. Shakya A, Singh GK, Chatterjee SS, et al. Efficacies of fumaric acid and its mono and di-methyl esters in rodent models for analgesics and anti-inflammatory agents. EC Pharmaceutical Sci. 2015;2:76‒88. Chen Y, Islam A, Abraham P, et al. Single-dose oral quercetin improves redox status but does not affect heat shock response in mice. Nutr Res. 2015;34(7):623‒629. Chen Y, Islam A, Abraham P, et al. Quercetin and heat shock response. Nutr Res. 2015;35(4):359. Dey A, Chatterjee SS, Kumar V. Effects of a Withania somnifera extract in a stressed mice model for obsessive-compulsive disorders. Abstract In: 2nd International Congress of Society for Ethnopharmacology (SFEC). Nagpur, India; 2015. Dibner JJ, Richards JD. Antibiotic growth promoters in agriculture: history and mode of action. Poultry sci. 2005;84(4):634‒643. Chassaing B, Koren O, Goodrich JK, et al. Dietary emulsifiers impact the mouse gut microbiota promoting colitis and metabolic syndrome. Nature. 2015;519(7541):92‒96. Aguirre L, Arias N, Macarulla MT, et al. Beneficial effects of quercetin on obesity and diabetes. Open Nutraceuticals J. 2011;4:189. Russo M, Spagnuolo C, Tedesco I, et al. The flavonoid quercetin in disease prevention and therapy: facts and fancies. Biochem pharmacol. 2012;83(1):6‒15. Lee J, Jo DG, Park D, et al. Adaptive cellular stress pathways as therapeutic targets of dietary phytochemicals: focus on the nervous system. Pharmacol rev. 2014;66(3):815‒868. Murugaiyah V, Mattson MP. Neurohormetic phytochemicals: An evolutionary–bioenergetic perspective. Neurochem int. 2015;89:271‒280. Shulaev V, Cortes D, Miller G, et al. Metabolomics for plant stress response. Physiologia Plantarum. 2008;132(2):199‒208. Williamson JD, Jennings DB, Guo WW, et al. Sugar alcohols, salt stress, and fungal resistance: polyols—multifunctional plant protection? J Am Soc Hortic Sci. 2002;127(4):467‒473. Cox LM, Blaser MJ. Antibiotics in early life and obesity. Nat Rev Endocrinol. 2015;11(3):182–190. Laparra JM, Sanz Y. Interactions of gut microbiota with functional food components and nutraceuticals. Pharmacol Res. 2010;61(3):219‒225. ©2015 Shrivastava et al. This is an open access article distributed under the terms of the Creative Commons Attribution License , which permits unrestricted use, distribution, and build upon your work non-commercially.